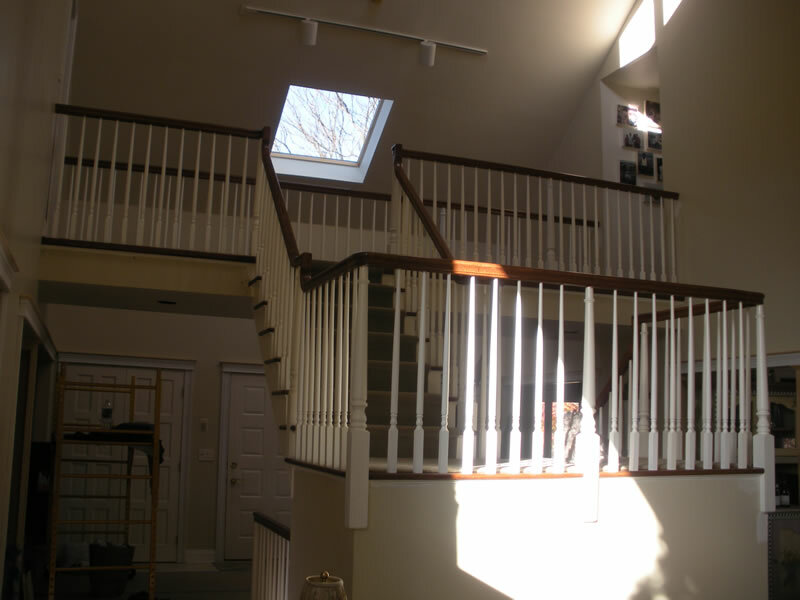 Client had had contemporary interior for the first twenty years they had lived there and was wanting a more traditional stairway. Cusparian Building and Design refinished all the treads, removed all existing rails and balusters and replaced them with traditional rails, newels and balusters. 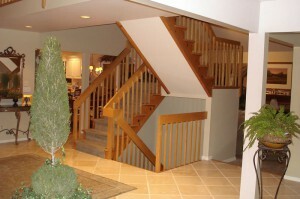 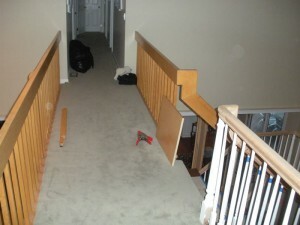 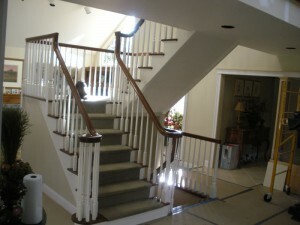 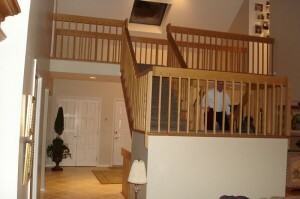 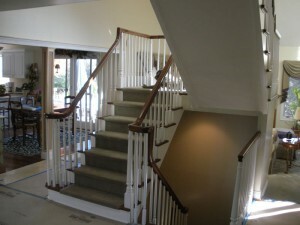 Before: Contemporary stairway and railings. 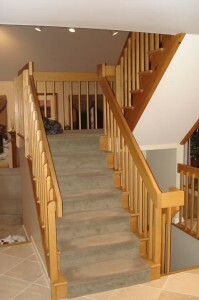 After: Traditional stairway and railings with new treads, rails and balusters. 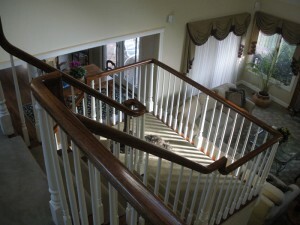 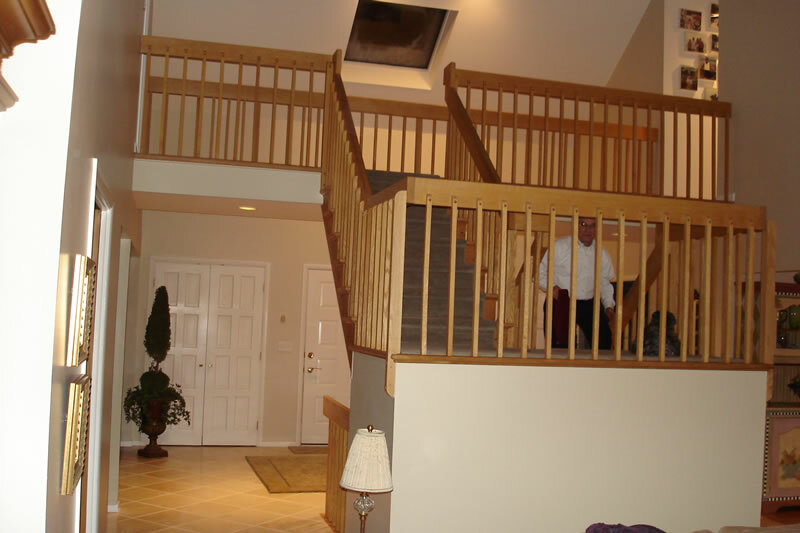 The squared off step on the first floor landing was rebuilt in order to put in a volute on the left side. 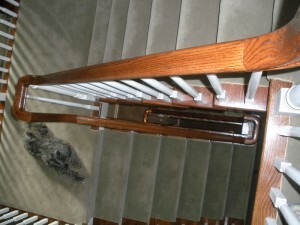 The client’s dog was Karl’s constant companion while he worked there. Due to the request of the owner, the standard rail connections on what is referred to as an over the post design, the new newel posts had to be notched 5/8” deeper in than usual in order for the rail centers to line up with the baluster line and the stringer lines of the stairway. 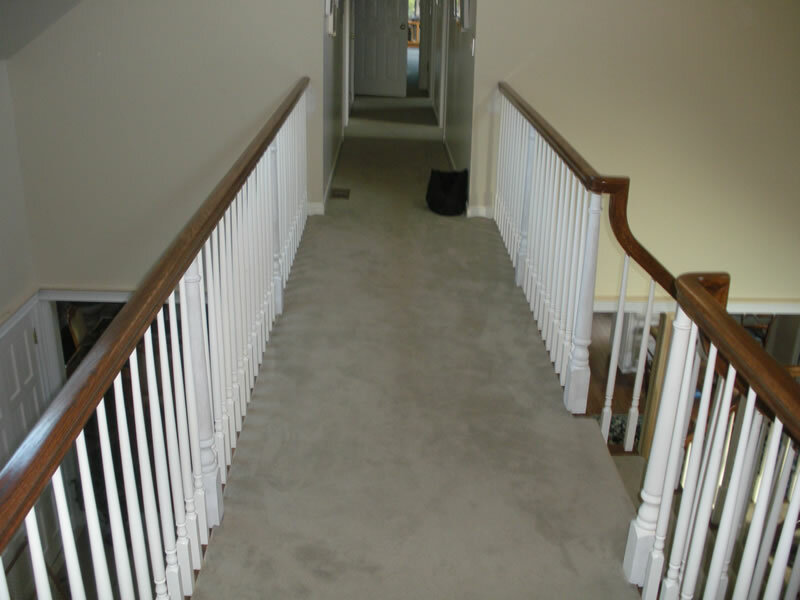 The owner didn’t want the rails to be wider where they attached to the newel posts which were also wider than the bottoms of the rails. 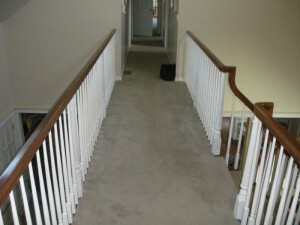 No rails could be left missing at the end of each day, and this picture shows the contrast of the two styles. 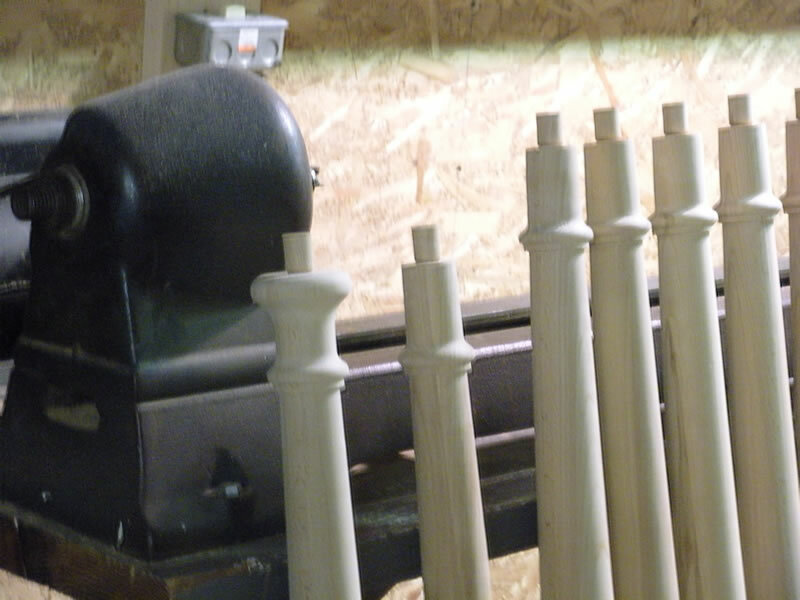 The top of the newel on the left is how the newels come from the manufacturer, so in order for the rails to match the tops of the newels, except for the one under the volute, all others had to be turned down on my lathe to match the width of the rail bottoms. 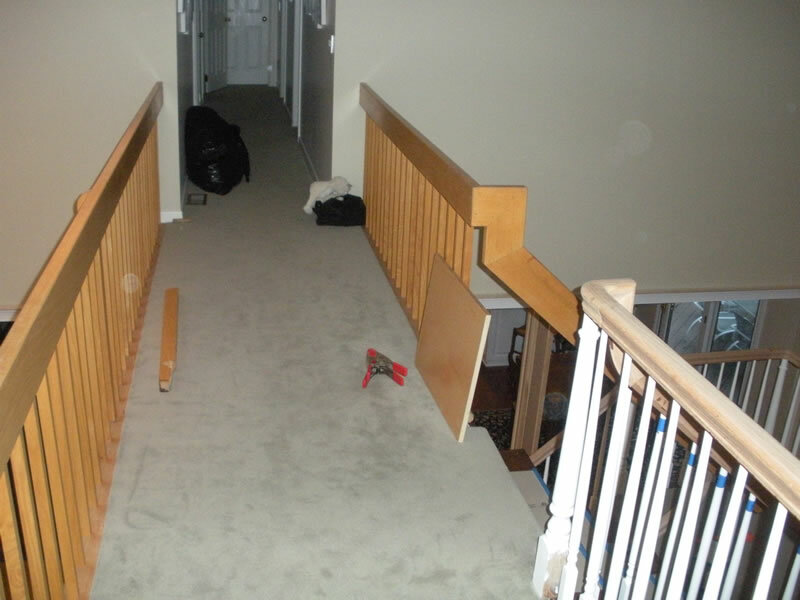 When doing over the post rail systems, the math to cut the intersecting pieces doesn’t generally follow the same math as general carpentry. The interlocking pieces are expensive and must be cut accurately. 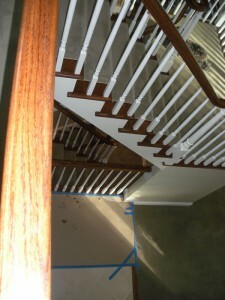 With this particular job, both sides were continuous for three stories.